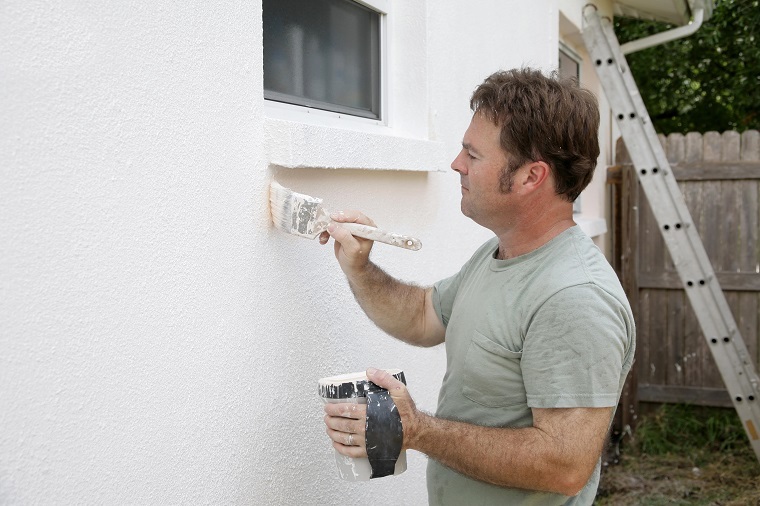 While we will give you plenty of advice on how to paint windows, we will also give you a great piece of advice if you are hiring a painter to paint your windows. Take a photograph of each pane of glass in such a way that you can see whether there are any scratches on the glass. Why do we tell you to do this? Because sandpaper scratches glass, and if an inexperienced decorator paints your windows, when sanding down the woodwork they may not be aware of any damage they are doing to the glass. On a dull day you won’t notice, but the moment the sun comes out you will see all the scratches made. However to avoid scratching the glass you don’t have to use masking tape, just use carefully folded sandpaper or a sanding sponge with a clean edge. It is then just a question of holding the sandpaper in such a way that the tips of your fingers rub against the glass while the sandpaper rubs against the wood to give a key for the paint and to remove any loose paint. Sand down all woodwork to remove any loose or flaking paint and to provide a key for the paint or varnish to be applied. Remove and replace any loose putty, allowing it to harden before applying one coat of oil-based primer. Never shut a freshly painted window until the paint has hardened or 'cured' or else it will jam shut. Finally, don't worry too much if you get a little paint on the glass. Leave the paint for about a week to cure, and then cut round where the frame and glass meet with a boxcutter or Stanley knife. After that use a 'window blade', which is a sharp flat blade in a holder, to push against the glass and then slide it up against the window frame. That will then lift off the paint on the glass and leave you with crisp clean paint lines.